After being in Cambodia, we were not sure whether Vietnam or any other place could match up to it. Touching down in Danang, the weather was cold and wet and there was no friendly and warm Den at the airport to greet us. Since the ride I had arranged never showed up (there was a man there with a “Ms. Stephanie” sign but when we all realized that his client was the other Western woman in the Danang airport who also happened to be named Stephanie, he quickly dumped our bags in the parking lot and left us standing there confused and bewildered), we had to bum a ride from Ben, a friendly Vietnamese student we met on the plane. With a little bit of stopping and questioning on the side of the road, Ben and his father finally found our hotel, Hotel Jimmy. Our hotel was a not so attractive building near the infamous China beach, but it being night, we could have been in any deserted beach town. Once checked into our hotel and changed into our winter clothes (which we had not wore since leaving China), we wandered down the street seeking an ATM and hopefully some Pho, Vietnamese hot broth that had always been comfort food to us in Seattle. In the end for dinner, we shivered in an open air, contiki style restaurant that would probably be the perfect setting in this beach town during the summer but was anything but on that cold, damp January night in Danang. We quickly jogged back to Jimmy in the deserted streets dodging the local rats and jumped into our bed to warm up for the night. Thus began our trip to Vietnam. Fishermen on China Beach or My Khe the morning after we arrived in Vietnam. Not to worry dear readers. This blog is not a rant about Vietnam. In fact, the trip got way better the next day. These are the ingredients that made the trip so unforgettable: motorbikes; Kiwi companions; a feisty woman named Tam; encounters with some locals; and the inevitable improvement of the weather. Just add some water (literally) and you have an unforgettable vacation in Vietnam. Riding around aimlessly on a motorbike we rented from Jimmy the next day, we spotted a couple on the side of the road holding a surf board. Now let me explain. Surfing was one of the main reasons why we came to Danang and China Beach. But seeing the dismal weather and lack of surfboard rental places (and surfers), we thought it was a lost cause. So when we met Zandre and Linselee on the side of the road, they gladly showed us the way to Tam’s Surf Shop about half a kilometer away from the beach. And that is where everything came together and how our trip was set into motion for the next few days. While sitting at Tam’s waiting for lunch and deliberating whether to rent the sought after long board, Matt and Naomi came in for lunch. Thus we met our travel companions/ now friends-for-life from New Zealand. Although considerably younger than us (they had just graduated from college/uni and were taking a month long holiday before Matt started his new job), we had a quick connection with Matt and Naomi. Like us, they had come to Danang to test the waters of China Beach and had an open schedule for the next week. Over the next week, the four of us travelled by motorbike up and down part of the coast of Central Vietnam while flexibly picking an agenda for our travels by our mood and the daily weather. From Danang, we travelled to nearby Marble Mountain as well as an epic day trip to Hue (actually we didn’t quite make it to Hue, as the downpour and crazy traffic from the Tet holiday led us to turn back before dark). From Hoi An, a beautiful ancient port city influenced by Chinese, Japanese and French traders and inhabitants, we celebrated Tet (Vietnamese New Year) and travelled to My Son; Cham Island; and back to China Beach in Danang for surfing once the weather had improved. In the evenings as well as for many of our mornings, we dined at Tam’s, the same shop where we rented surfboards. Dining at Tam’s became a ritual for us as she really cooked the yummiest comfort food I’ve had in Asia. Opening at 7 every morning, Tam would make her bread rolls from scratch every day. She and her daughters would prepare meals for customers in the little kitchen in the back of the surf shop where they presumably also lived. Mornings we usually all ordered bacon, scrambled eggs and potato wedges and evenings her cheeseburgers or spaghetti bolognaise really hit the spot. Her American style food, although simple, is so far my favorite in Asia as it reminds me more like something Mom would make just for me with a little TLC. Since food was made from scratch and prepared only when customers ordered it, it was usually a 45 minute to hour wait. But the wait was worth it and once we were happily eating and Tam had finished cooking, she would pull a chair up next to us and begin to tell stories about her past. With Tam in her surfshop and diner. Danang, being just south of the former border between North and South Vietnam during the Vietnam War and being the major offense point for strikes into North Vietnam, was right in the middle of the action during the war. Although I’m not sure whether Tam heralded from Danang or Hue or elsewhere, she came of age during the war and has positive and fond memories of US troops. The US troops took her in, offered her jobs (which helped her family) and protected her. 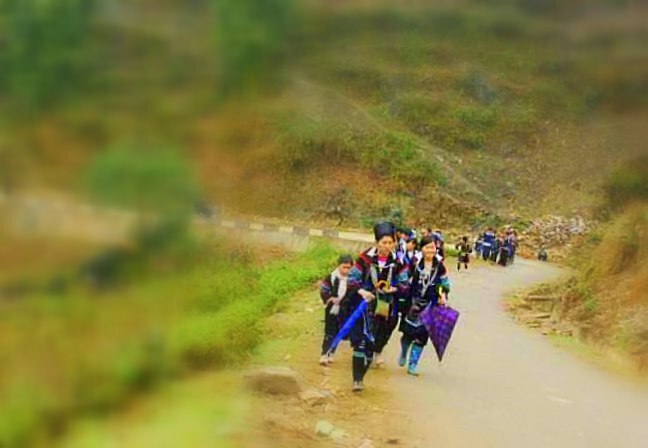 When recalling stories of the war, Tam would get a twinkle in her eyes and seem to be transported back in time. The GIs, she affectionately referred to as “her boys”. Many of “her boys” may have only been briefly part of her life but forever left a mark in her memory. Some of her boys, now grown men, fathers and grandfathers, have returned to Vietnam in recent years to locate where they were stationed during the war; or a spot where they had a few fleeting, happy memories; or where they fought a hard battle and maybe lost a friend. Some of these grown men Tam knew when she was a girl, known as the “Crazy One”. One returned to Vietnam with his grown son and located a spot where Tam and he had been under ambush and where he had saved her life. Another vet, who had not known Tam during the war, had heard about Tam through other vets who had travelled back. Tirelessly he had been trying to find his son, left behind as a toddler at the end of the war. When he finally met Tam in recent years, he had already been on three separate trips to Vietnam and had paid a lot of money to various parties to help him find his son to no avail. Tam recalled the story of taking a motorbike up a steep, wet mountain to a remote village where she found the man’s son, a spitting image of his father. Father and son were reunited after 30+ years. Although separated by thousands of miles and years and language difficulties, father and son have been slowly getting to know each other better and perhaps can begin the process of healing from years of loss, abandonment, and separation. The father, who never married or had any children in the US, now has a family and a legacy in the world. In addition to helping vets, Tam has met wives, sisters and brothers who have come to Vietnam for a better understanding of the place where their husband or brother fought and may have lost his life. She has helped them also locate spots where their loved ones may have gone missing or been killed, thus providing hopefully some form of healing and closure for loved ones. In the years following the war, Tam’s life was at times very difficult and included additional tales of abandonment, poverty and other trials and tribulations. Nevertheless, Tam took in and adopted children and trudged along and persisted to provide a better future for her family. I have so much admiration and respect for Tam’s persistence, compassion and her heart of gold that has helped make it possible for so many families to heal, find closure, forgive and love again. Before coming to Vietnam, I was under the illusion that being American, we would not be received warmly in Vietnam given our history there. However, the US’s complicated 20th century history with Vietnam is now interwoven. Indeed there are many Vietnamese communities in the US, a legacy of the war and its aftermath. Furthermore, while Vietnam is still very much an agricultural and rural country, it appears to be on the brink of being the next big hot-spot for the US (and other countries) wanting to do business in Asia. Indeed, many international companies are starting to close shop in China and are moving South to open factories and plants in Vietnam. Tourism has also boomed in recent years too. Some people we met said that before 1993, Vietnam was very much closed off the rest of the world, but over the years, more and more tourists have made Vietnam their destination in Asia. No longer is Vietnam a destination you can go as a tourist and be a loner. Most of the tourists I saw were from Australia, a now short plane ride away from Down-Under and an affordable vacation trip for a week. Nevertheless, we did not seem to encounter many other Americans and when people learned of where we were from, they did not react negatively. Maybe it’s because we had some Kiwi companions or because the war was long enough ago that most people have put it behind them. Our trip to Vietnam was also made memorable by some random and fortunate encounters with some locals. Young people invited us to join their Tet (Vietnamese New Year) festivities of playing guitar and drinking beer and telling stories in the park. There was also Ngahn, a mechanic who fixed Matt’s motorbike when it broke down and invited us into his home during Tet for lunch and then accompanied us for the afternoon with his daughter to the Champa ruins at My Son. Our departure from Vietnam was almost as anticlimactic as our arrival there. Weather was poor and our ride did not take us to the border crossing as had been arranged. And although there was no warm send-off when we left, unexpected encounters for a few fleeting hours with friendly people; children playing peek-a-boo on the train; and drive-by “hellos” and “where are you from?” while riding our motorcycle through the countryside; all made our trip to Vietnam the memory of a lifetime. It seems that Cambodia has experienced a boom in tourism in recent years. It may not yet attract the numbers as its northwestern neighbor Thailand, but it definitely gets its share of visitors from all over the globe. This was apparent to us immediately as we arrived in Siem Reap and saw that we were in good company with fellow tourists from the US, France, Germany, China, Russia, Australia and so on. It’s true you can hardly go more than ten feet down the main street before you are bombarded by locals offering massage services, tuk tuk transport for the day or hoping you will stop in their shop to buy a Northface knock-off backpack for $15. US dollars are the main form of currency in Cambodia and although you sometimes may get change in Riel, the local currency, all ATMS dispense dollars and most transactions down to even the grassroot level are done in dollars. Although there are no McDonalds or Starbucks in Siem Reap, gourmet sandwich and salads and Mexican food are all within a two minute walk. Siem Reap is indeed a town for tourists. Of course the main reason why we all come to Siem Reap and Cambodia for that matter is the nearby magnificent ruins of Angkor Wat. For me it was magical seeing the sun poke up behind the Angkor Wat temple at 6 am and then spending the day climbing up ruins to the treeline and imagining we were kings admiring our kingdom below. 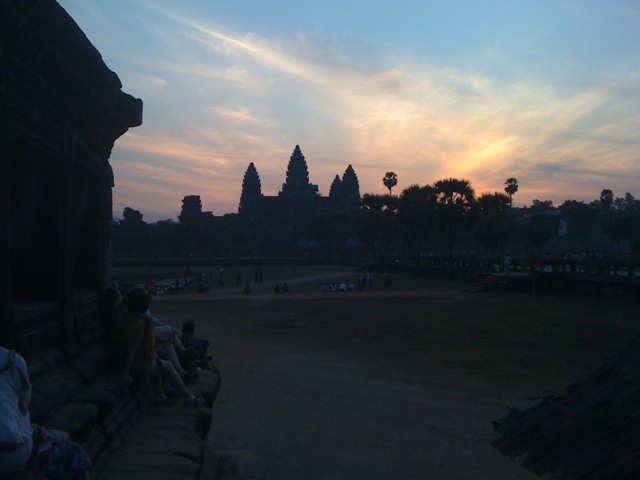 I was fulfilling a dream coming to Angkor Wat and I didn’t mind sharing it with others. Cambodians are gentle, quiet and polite people, particularly adults. Children we encountered seemed to come out of their shells a little more and loved greeting tourists and showing us around. I was a little surprised initially to see so many children out and about in the middle of the day and not in school. Keiko, a Peace Corps volunteer from Seattle we met, explained that many children, particularly in rural communities, go to school for half-days. This allows them to help their parents at home or in the fields for part of the day. Some children may go to school in the morning, some in the afternoon. Indeed, children really are the backbone of Cambodia and while it’s true that every country sees hope and future prospects in their children, this case is even more acute in Cambodia where 50% of its population is under the age of 22. This is a sad and sobering result of the civil war and the terror of the Khmer Rouge that ravaged Cambodia in the late 1970’s to the early 1990’s. Rarely did we see people over the age of 40 during our week in Cambodia. From Keiko; our encounters with locals; and a booklet called “Dos and Don’ts in Cambodia” (yes- there was such a thing- and quite informative too! ), we learned about some proper etiquette in Cambodia. Although it’s a country with a very young population, certain elements of society are still quite conservative. This comes from the fact that a majority of the population practices Theravada Buddhism, which I have learned is the oldest surviving Buddhist school. I got an understanding of this rich history while visiting a local wat or temple in Siem Reap. 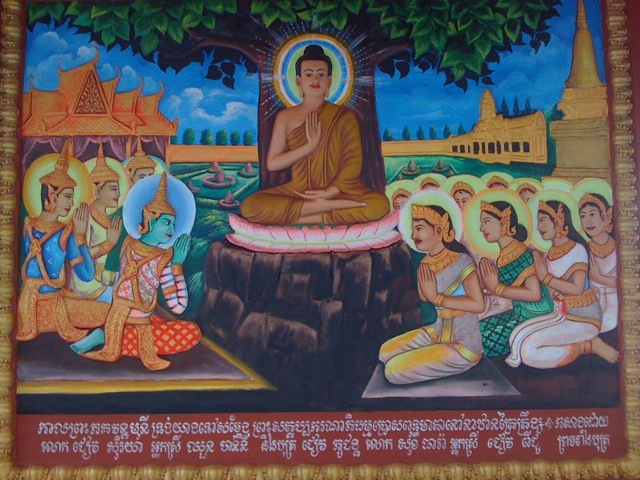 A beautiful and colorful mural told the story of Buddha in several panels around the perimeter of the temple. Unknowingly I committed one of the “Don’ts” of Cambodia by approaching one of the male monks and asking him a question about the mural’s story. You see, it is taboo for a woman to speak to a monk or for him to even look at a woman. To be fair, he did approach us, but he had another man (who was not of the cloth) in tow and he was probably trying to engage in conversation with Derek. Then, while on a bus trip from Battambang to Siem Reap, Derek had a very chatty and friendly monk sit next to him whose English was so good that he had started an English language school. Derek soon learned from his friendly monk about the gender etiquette. Derek asked what would have happened if his girlfriend had sat next to him? Without offering much reason, the monk replied, “I just couldn’t.” This he said before calling his sister on his cel phone and having Derek chat with her in English for a few minutes! So it seems that Cambodians live with a long, proud history of tradition that is now intertwined with elements of modernity. Certain traditions and etiquette are deeply engrained and common place. Keiko explained that had I unknowingly sat next to the monk, the entire bus would have collaborated together to make sure that the monk’s honor and my humility would have been spared. Our week in Cambodia was all too short and provided us only with a sampling of its rich history; its quiet and warm people; and its stunning scenery. I envied Keiko and her boyfriend Tyler a little for having had the opportunity to spend two years experiencing Cambodia. Both Derek and I realized that one week was too short to visit it. On the day we left, it was only apt that our friend Den, out first introduction to the warmness of Cambodia, brought us to the airport. As we exchanged email addresses and said our goodbyes, I bowed to him with a sompiah and Derek shook his hand. It seemed silly that I was feeling regretful and a little choked up about leaving Cambodia after only one week. I guess we’ll have to find a way to come back again and get a greater sampling of it. I finally have the chance to catch up on some blogging. Derek and I have been outside of China for the last month traveling in the Philippines, Cambodia and now Vietnam. I have had a lot of blog topic ideas in my head but somehow the time has just slipped by and next week we’ll be headed back to Nanjing where I will be thrown into a busy, hectic schedule again. Anyway, while I have a little break in our hectic travel schedule, I thought I would first recap our trip to Philippines. The Philippines holds a special place in my heart and within my family’s history. From 1984-1989, my family lived in Manila- five influential years of my childhood and early adolescence. Before that, my parents were Peace Corps volunteers there in the early years of the program from 1965-1967. Bill, my stepfather, also lived with his family in the early 1960’s in Manila. Finally, my great-grandfather, Julius Jenss, sought adventure in Dagupan, Philippines selling slot machines in the early 1900’s in the years following the Spanish American War and the beginning of a new era of foreign influence in the Philippines. Given my extended family history in the Philippines, it was pretty uncanny when Derek came into my life and on our first date, told me that his own father lives in the Philippines. So, it’s meant to be- the Philippines and its draw to me and my family. What has now permanently strengthened my ties with the Philippines is that Derek (and I through him) now has an extended Filipino family. On this trip down to the Philippines, we spent some time with Derek’s father Doug and also got to meet his wife Rowena and their children Angel, Faith, Derrick, Charlene and Simon. Derek’s brothers and sisters took to him very quickly and affectionately called him Kuya or “big brother” in Visayan, which they spoke along with English at home. I too have been dubbed “Auntie Steph”, which I enjoy. For me revisiting the Philippines was also made unique by the opportunity to spend time with a Filipino family. My childhood years in Manila gave me the opportunity to meet Filipino friends as well as friends from all over the globe. However meeting Rowena’s family was the first time I really got to spend extensive time with a Filipino family and therefore learn about the important role that family plays there. What I have experienced in the US is that many children move out of home once they come of age and then only see extended family during major holidays. However, in the Philippines, it seems that many children continue to live close to their family even after they have grown up. It’s not uncommon for grown-up sisters, brothers, and even cousins to live under one roof where they may help each other out with raising each others’ children, housekeeping, cooking, etc. In a Filipino family, children therefore grow up with a large but close-knit family. This was interesting for me to see first-hand with Doug and Rowena’s family. Admittedly I am a person who needs her own time and space sometimes and would have to adjust to living under such close quarters. Nevertheless, I do relish the few times in the year when I do see my parents, sisters and grandmother as well as extended family with all my cousins and wish that spending time with them wasn’t always squished into a one week period within a year or two. Communities with strong, close-knit families like in the Philippines have their merits for sure. Riding in a jeepney and tricycle: Jeepneys are extended jeeps that the Filipinos cleverly modeled from jeeps left by American GIs in WWII. 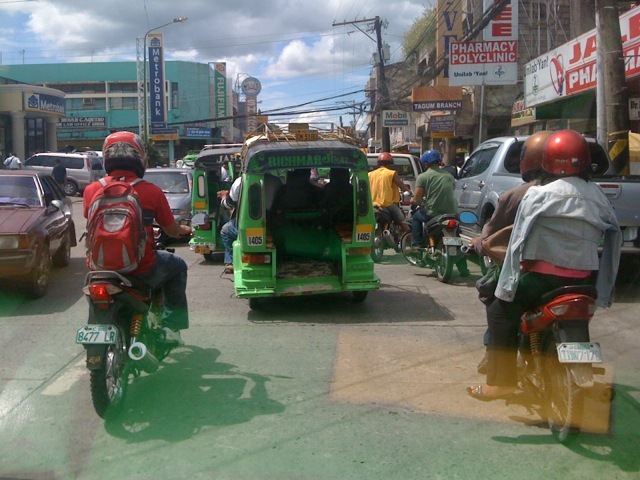 They are probably the most widely-used mode of transportation in the Philippines. 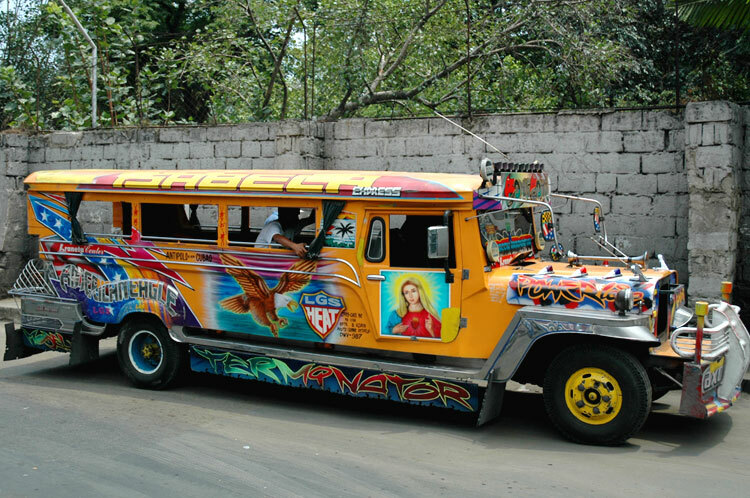 Jeepneys are family owned and operated and drive along a certain route. The destinations are penned on the side of the jeepney as well as on signs on the front dashboard. Passengers enter the jeepney in the back and then sit on a long seat along the length of the jeepney facing passengers on the opposite side. A ride in Manila was only 7 Pesons, about $.20 and payment is handed up by passengers in the back to the driver in the front. Another common mode of transportation are tricycles- motorbikes with extra seats you can hop onto and tell the driver where you want to go. Sometimes you’ll have to share the ride with someone else. Bangka boats, nipa huts, disappearing islands, and snorkeling: Need I say more? Beautiful white sand beaches, untouched coral reefs with bright blue star-fish and an array of tropical fish. And to top it off, how about some freshly cracked coconut juice picked from the tree five minutes before while you were out snorkeling? Polvoron, calamansi juice and Chippy: My favorite Filipino snacks and junkfood. 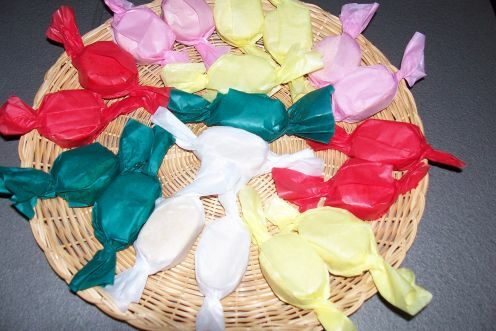 Polvoron is powdered milk candy. Sounds strange but yummy! Karaoke singing at home or by the pool: The experience is made even better by the wide selection of cheesy 80’s music that seems to be embraced with such fervor in the Philippines. Filipino communication skills 101: Here is a lesson on communicating with a Pinoy. If someone asks you a question and you want to respond affirmatively “yes”, simply look at that person and raise your eyebrows once. If someone asks you where something is, simply point in the direction of said object with your lips. If you would like to get someone’s attention, simply make a very slight hissing sound. 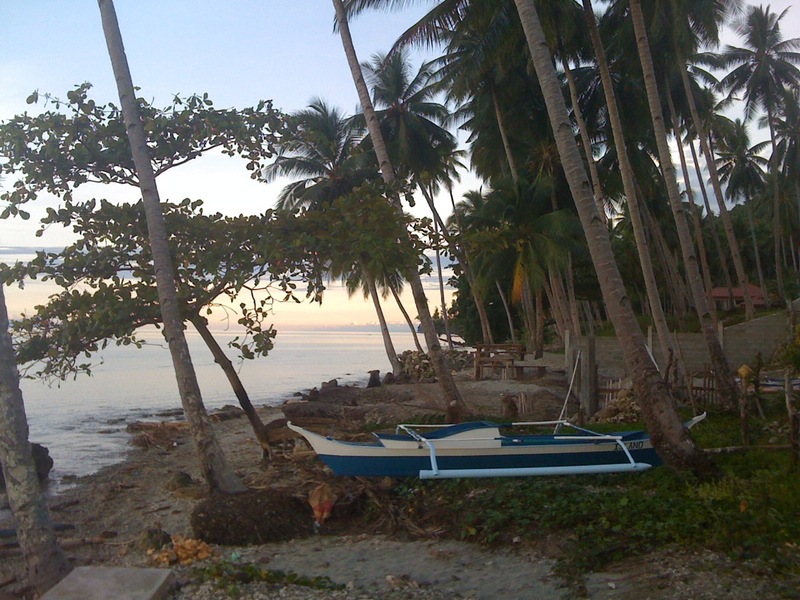 Lovely people: Besides the beautiful beaches, I think the Philippines biggest draw is in fact the Filipino people. Getting around is not a problem because English is so widely spoken. People are warm, gracious, friendly and are always happy to show you Filipino hospitality.